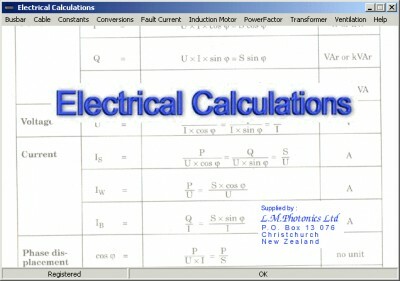 Electrical Calculations 2.70.0.4 free download. Electrical Calculations software provides calculations for busbar and cable ratings, static and bulk power factor correction, motor starting currents and curves, enclosure ventiation, transformer calculations and many metric / imperial conversions and constants. Written for Electrical Engineers and tradesmen. Secure Password Store is a secure Password database manager that stores all passwords in a safe database. Electrical Motor Control Circuits is a first class electrical training software built on a Basic Techniques program. Coco is a fully functional scientific calculator, designed to serve as a useful tool within the Windows 95, NT, 98, 2000, ME, XP environment of your computer. MITCalc3D for SolidWorks is a useful software that can do mechanical, industrial and technical calculations. Also available for Palm and PocketPC handheld comptuers. MITCalc3D for Autodesk Inventor is a multi-language set of mechanical, industrial and technical calculations for the day-to-day routines. Quick Compute - Type in calculations with nested parentheses: (((7 + 3) / 2) + 5) / 2. ChemMaths is a chemical engineering, mathematical and chemistry program.